Newport, RI, November 18, 2014 – The Queen Anne Square Maintenance Trust has been established for the care and maintenance of “The Meeting Room”, an installation by Maya Lin, at Queen Anne Square in Newport. 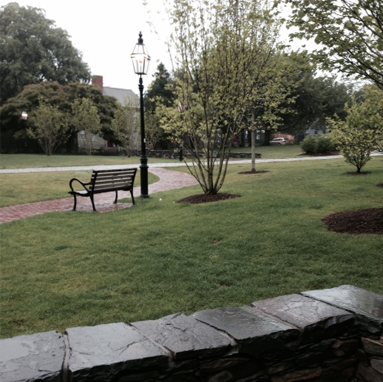 The $600,000 Trust is designated to support the additions to the park. The Meeting Room was opened to the public in May 2013. The Newport Restoration Foundation, and its offshoot the Doris Duke Monument Foundation, raised private funds to support the design and construction of the installation as a gift to the City of Newport. As part of the agreement with the City, which holds ownership of the property, a maintenance fund was to be established for the financial stewardship of the installation. Per the agreement a Trust was to be established at $500,000. Due to the generous support of donors, including the van Beuren Charitable Foundation, the Trust is currently valued at $600,000. The Queen Anne Square Maintenance Trust will be managed by a board of Trustees including Victoria Mele, President, Virginia Purviance, Vice President, and Scott Wheeler, Secretary/Treasurer. Initial funding for “The Meeting Room” at Queen Anne Square was provided by: TheDoris Duke Charitable Foundation, Alletta Morris McBean Charitable Trust , Hamilton Family Foundation, Prince Charitable Trusts, Rose and Charles Dana, van Beuren Charitable Foundation, Marion Oates Charles, David B. Ford, Edward W. Kane and Martha J. Wallace, and the Newport Restoration Foundation. Formed in 2014 as a 501(c)(3) private foundation, the Queen Anne Square Maintenance Trust (QASMT) was created to support ongoing maintenance of Queen Anne Square and the public art installation known as “The Meeting Room”. The foundation’s goal is to ensure the park’s longevity and beauty for locals, visitors and future generations. For more information regarding the history of Queen Anne Square visit www.QueenAnneSquare.org. It’s been just about one year since Queen Anne Square was rededicated after a $3 million redesign led by the famed landscape architect Maya Lin. The effort, which was led by the Newport Restoration Foundation and the Doris Duke Monument Foundation, was not without controversy. For months, Newporters went back and forth over the appropriateness of the design and the expense of the project (which was funded solely with private donations). At times, the debate became rather heated as letters to the editor filled endless column inches.